A cute dress and cardigan is perfect for attending a charity luncheon. I’ve said it before and I’ll say it again- I LOVE dresses! One reason I love them is because essentially they are the whole outfit. No need to worry about matching top and bottom- it’s already done for you. Throw on a little jacket- or in this case cardigan, add some cute shoes and you’re set. 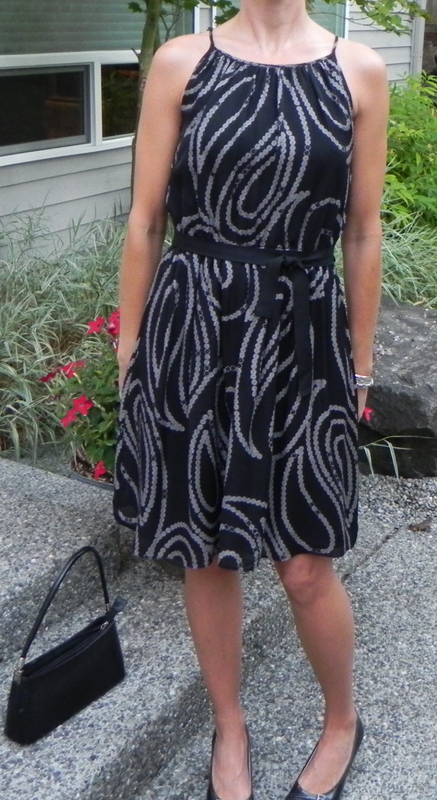 This dress is a good choice- it’s sweet, it’s simple and it’s perfect for the fundraising luncheon I’m attending today. It’s for Starlight Children’s Foundation– which is an incredible organization that works to bring joy and happiness into critically ill children’s lives. Enough said. Because of the high neckline and busy pattern I decided to skip a necklace. I just got home from my charity lunch and a gal there had on the exact same dress as me! Too funny! She paired hers with a cropped leather jacket- I loved it. Didn’t have my camera, darn!